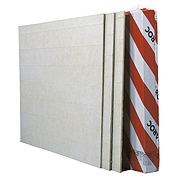 Wall board PAROC WAB 10t is non-combustible stone wool insulation for existing and new ventilated external walls. The thin wall insulation board can be used as an external layer of two layer-systems in combination with another thermal insulation layer. With a two-layer system you can create a continuous thermal insulation layer with staggered joints to improve the thermal performance of the wall. The wall board is faced with natural coloured glass fibre tissue.